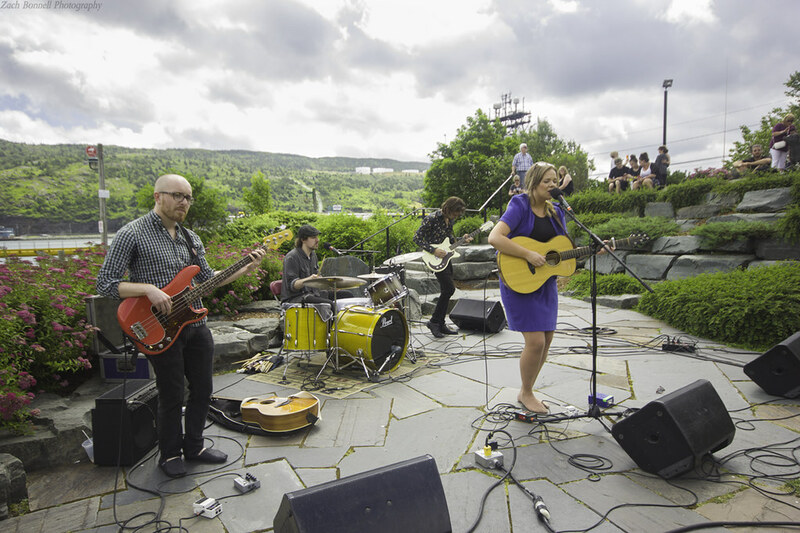 Does your city have a downtown park? I am not talking about a front lawn or a walkway but an actual park in the city core where people can actually walk to for lunch at noon. The best example I can think of in Canada is London's Victoria Park that's a real beauty and right in the core which is no more than 2 blocks from nearly every office tower in the city. I am sure there are others. 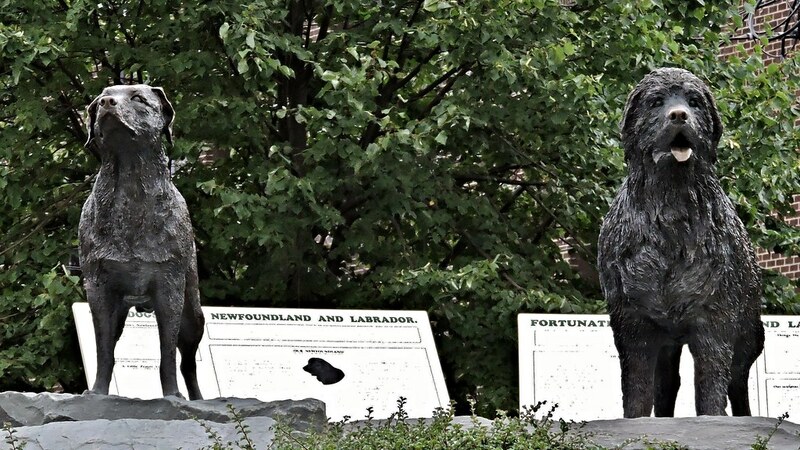 There's really only one park in the heart of downtown St. John's. The rest are smaller than a house in size and mostly stone. It's split in two by Water Street, our main downtown drag. 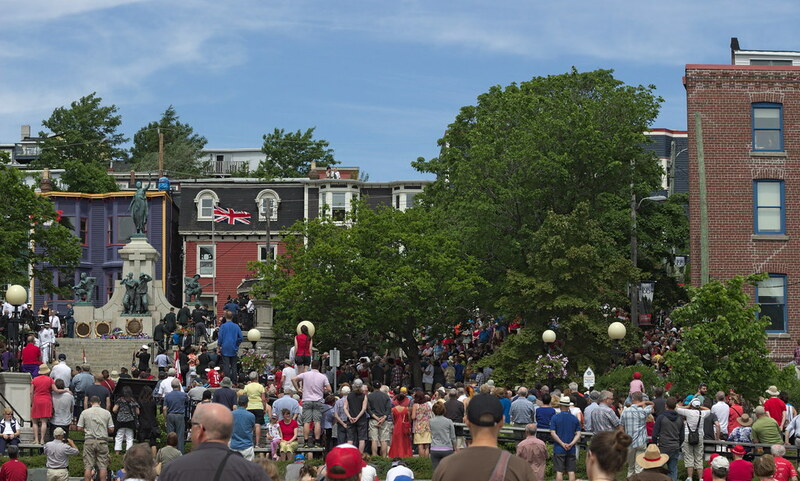 The lower side is Harbourside Park, and the upper side is the National War Memorial. Left-most circle is a proper park, but it's at a high elevation so you wouldn't just stumble there from downtown, despite how close it is, because it's straight uphill. Middle circle is beside a church. I've never seen anyone just lying there like they do at National/Harbourside. Just people who let their dogs off-leash there. And the final one is National/Harbourside. Last edited by SignalHillHiker; Dec 26, 2018 at 11:29 PM. 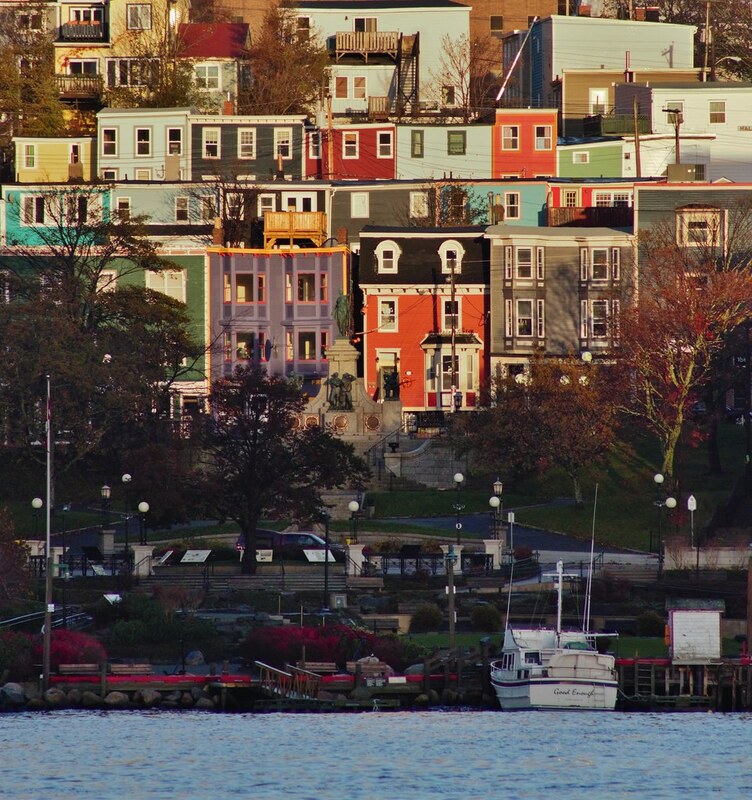 Downtown Halifax is framed by parks or park-like environments on 3 sides - the Boardwalk on the east, the greenbelt consisting of the Citadel, the Commons, the Public Gardens, Artillery Park, and Victoria Park to the west, and Cornwallis Park to the South. 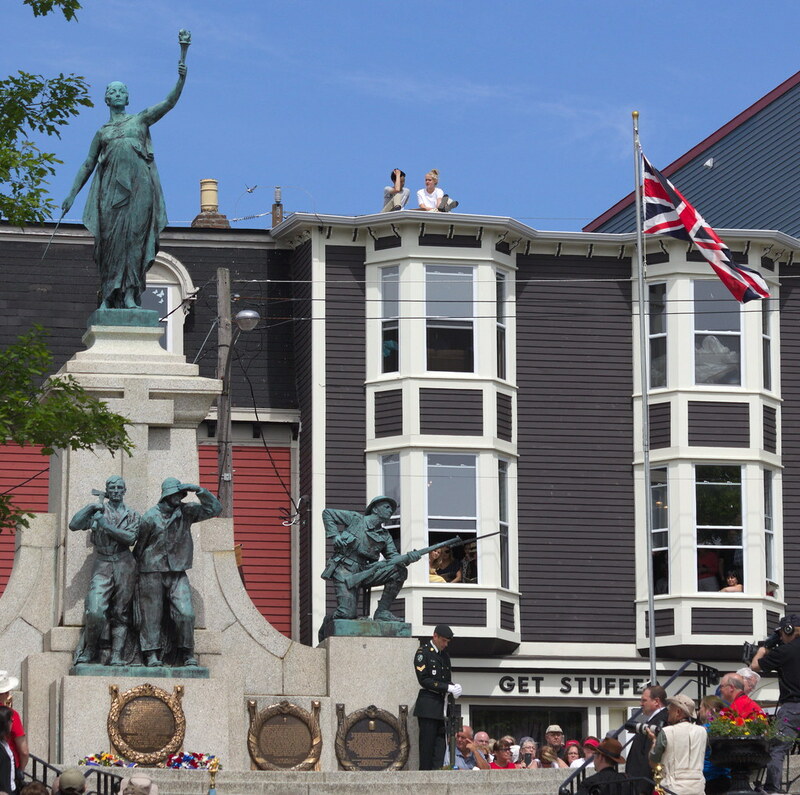 Grand Parade (major public square) is in the historic centre of downtown, which is a bit north of the modern geographic centre of downtown. All of these areas are well-used (in good weather) in the ways suggested by the OP. One just outside downtown - it borders the Downtown, Georgestown, and Bannerman neighbourhoods. Then there is Wascana Park that winds among the University and the Provincial Government offices. Berczy Park is incredible. Nothing else like it in Ontario if you ask me. Regina recently didn't that Woonerf type thing between their downtown park and the main office buildings, which looks great as well. 1) Anywhere on the gulf islands, beauty and nature everywhere. 1) The whole place looks like a beautiful park. 1) Never been, but I'd imagine it has the same effect as the place above. 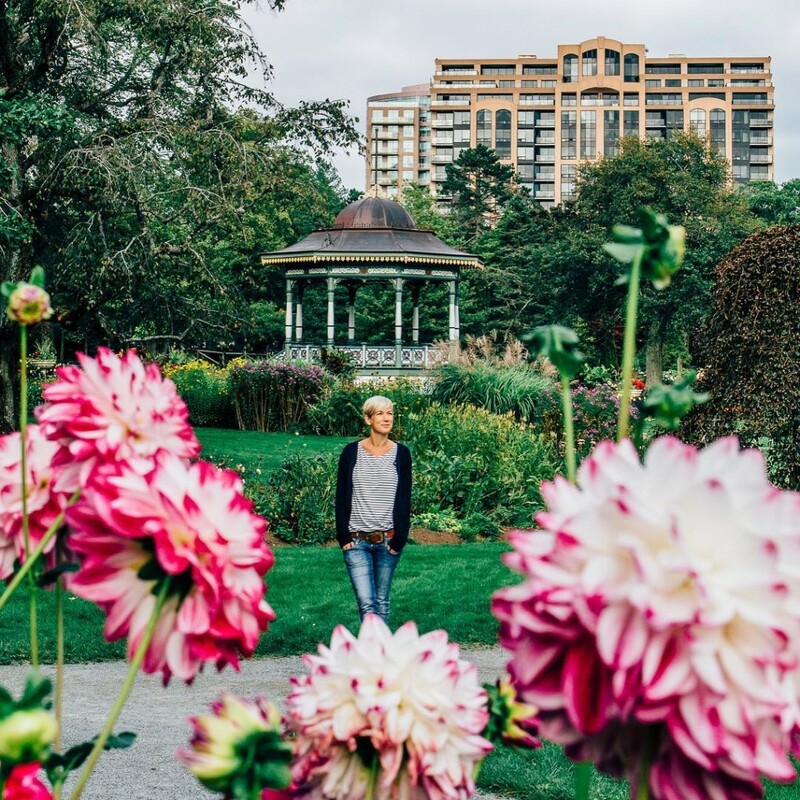 The best in Halifax is the Halifax Public Gardens. It's right downtown and one of those highly manicured parks. Point Pleasant Park is fabulous and feels similar to Stanley Park in Vancouver. I'd rank it slightly ahead of the Halifax Public Gardens except it's a 15 minute trek from downtown so not really downtown. I don't like the Halifax Commons much but imagine it will improve over time. I'd prefer it if it had more trees. Last edited by isaidso; Dec 27, 2018 at 8:55 AM. Rec Beach is literally nowhere near downtown Vancouver. It's like a 25 minute drive plus a 20 minute walk. Totally dope place though, just most definitely can't be included as a downtown park, like at all. Perhaps you mean English Bay? Banff has a beautiful downtown park - called Central Park - on the Bow River. Sandwiched between the old downtown and the old Parks Administration Building, next to the Bow River Bridge. Unfortunately no good photos of the park online. 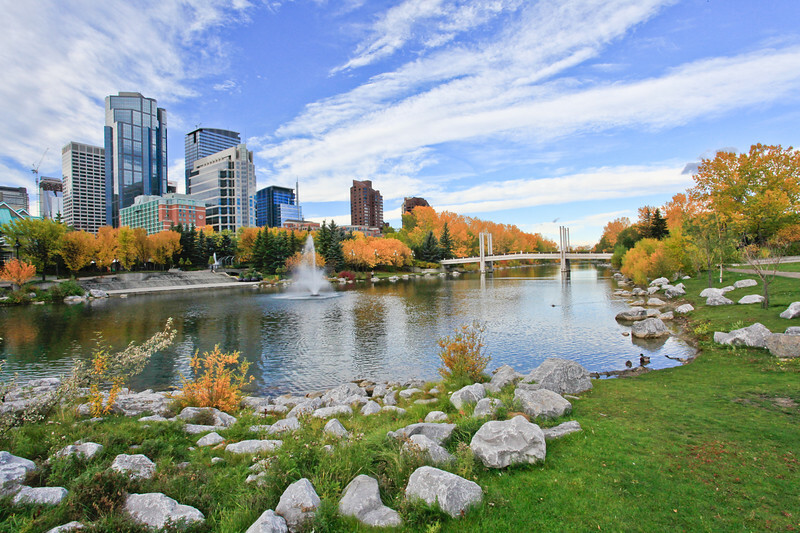 Prince's Island Park is easily Calgary's most popular park, being located right downtown at Chinatown and Eau Claire. The eastern end of the park is a natural wetland/lagoon that recently just finished a restoration after significant habitat damage was done by the Great Flood of 2013. The western end of the park is steps from the iconic Peace Bridge and Delta Garden. 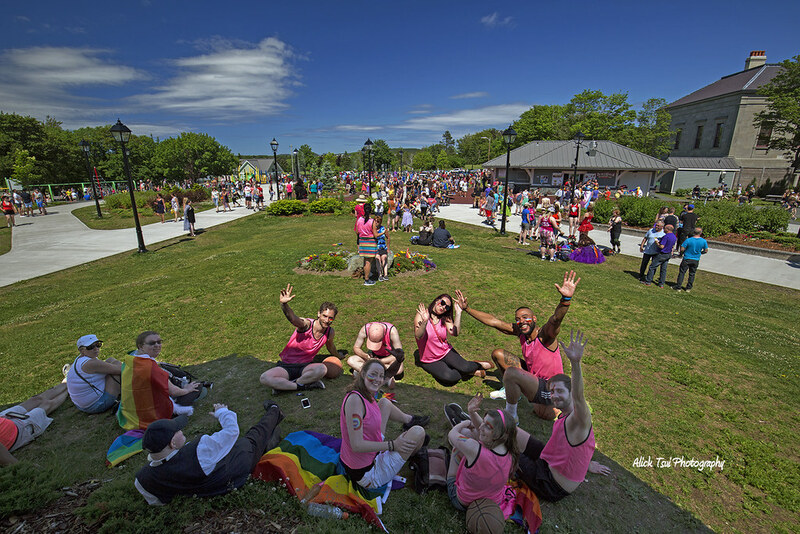 The central areas play host to a ton of festivals throughout the year, including the Folk Festival, and the Party in the Park festivities after the LGBT Pride Parade every September. 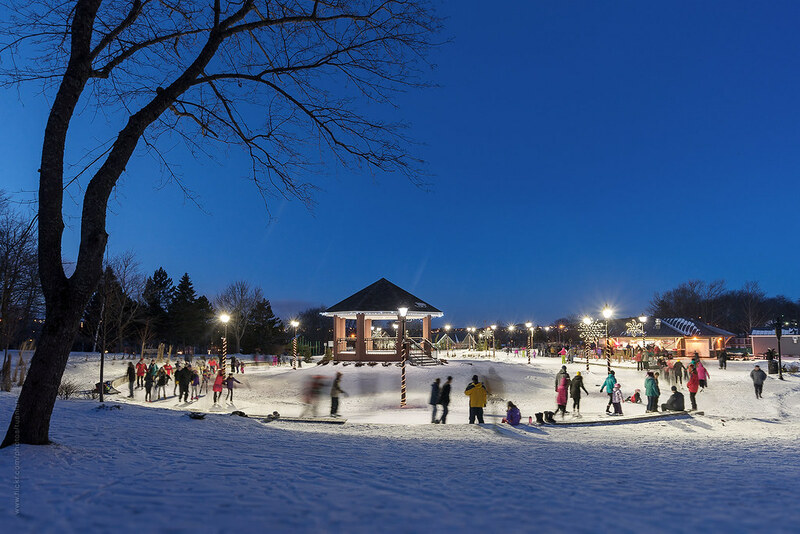 The branch of the river between the island and downtown is turned into a skating rink every winter. St. Patrick's Island Park is another gem of the city, and recently underwent a $50-million revitalization. 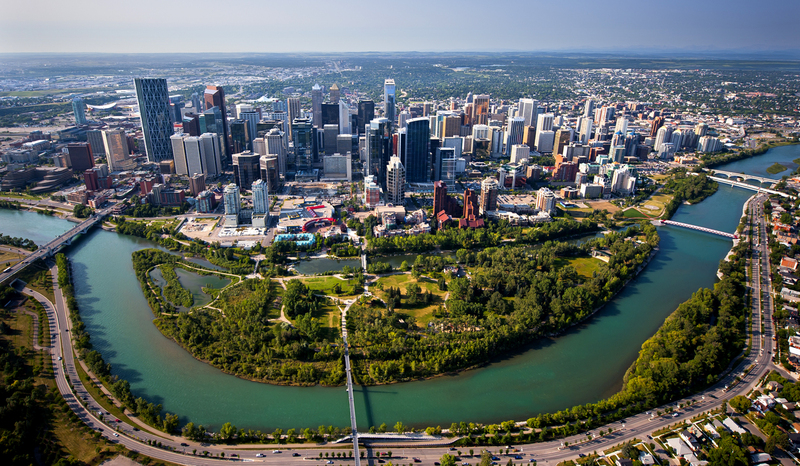 Back in the 50s, three islands were joined to create St. Patrick's Island and St. George's Island, the former becoming a campground, and the latter the Calgary Zoo. After the campground closed, the area became a cruising spot for gay men and a generally overgrown space for decades. 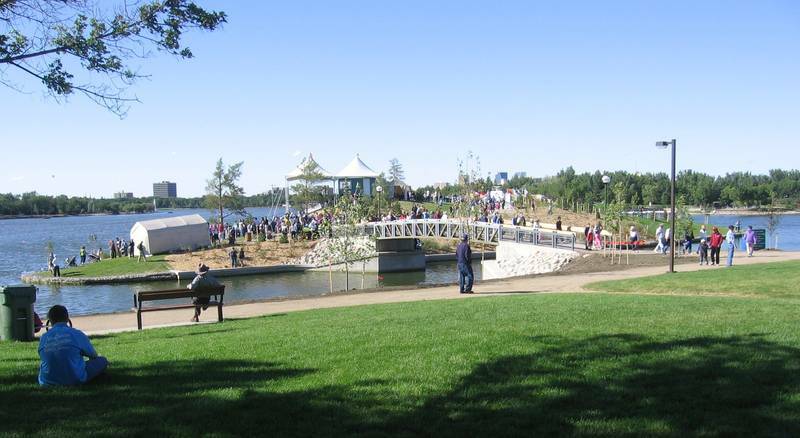 After the Calgary Municipal Land Corporation took over the revitalization of the East Village, they renaturalized the island, restoring the river breach between the two halves, installing a pebble beach, and creating multiple different programmable areas within the park. It is without a doubt my personal favourite public space in the city. The Harley Hotchkiss Gardens in the centre of the Central Business District is a little green oases in the middle of the jungle of glass that is downtown Calgary. The park was recently revitalized when the Calgary Consolidated Courthouse Tower (the largest courthouse in North America) was built. A nice little gem that not many outsiders get to see is McDougall Park, snuggled into the northwestern corner of the Central Business District. The McDougall Centre, in the middle of the park, is a very important facility for the government of Alberta, as members of the southern part of the legislature will meet there to discuss matters if not required to be in Edmonton. And finally, Central Memorial Park in Calgary's Beltline. Established in 1889, it was the first municipal park in what is now Alberta, and host to one of the first public library branches in the province. The space is little slice of Victorian Britain in the heart of Calgary, and was named a national historic site this past summer. And if you include the Toronto Islands, then you have to include the Jean Drapeau park on St-Helen island and also the park on Notre-Dame island, both closer to Montreal downtown than their Toronto equivalent. But since the question is what are the « best downtown parks in Canada », I guess Mont-Royal park would be the natural choice for Montreal. All the rest are merely squares or « places » like Place Jacques-Cartier or Place d’Armes. Even the linear park of the Old Port is no match to Mont-Royal park. IMO, Toronto lacks a proper large downtown park. Queens park is pretty large and relatively centrally located, but yea, there isn't really a single large downtown park. I often feel that Nathan Phillips Square would have been better off as a nice large park.. but too late now. There is Allen Gardens and Moss Park which are both pretty significant in size, but are extremely underutilized and are in rough parts of town. Moss Park could probably be a great park if the Armoury was moved, and the park upgraded and expanded onto the entire block, and the area cleaned up a bit. The southeast corner of the park is one of the roughest intersections in the city though, which makes it tougher. Berczy is great, but it is very small. Claude Cormier is now planning a similar park at York and Queens Quay which is a lot larger and looks quite promising. Trinity bellwoods is really rather run down (as are most Toronto parks really), but is probably one of the liveliest in the country on a warm summer day. The place is a total zoo. Not really downtown in the traditional sense though. I would say the revitalization of Grange is as good as Berczy. It's a downtown park. It's some distance from the office core. I guess they all are. Roundhouse Park is probably the largest space besides Harbourfront next to the core. It is more a green roof than a park. 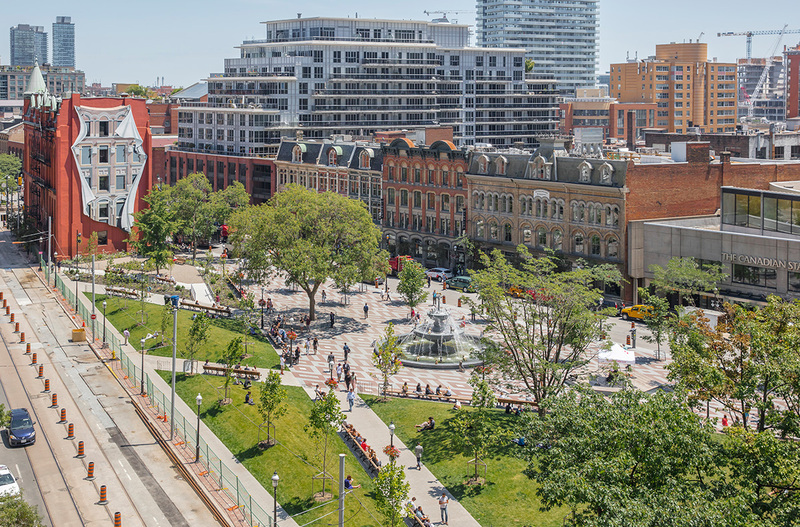 Berczy Park is something else, it looks like something you'd expect to see in Paris or NYC. One interesting little detail is that those benches don't have anti-sleeping-homeless-person armrests. Those are relatively flattering photos, although it’s a big step up from the shabby mess that was there before. In the second photo, the plain brick building in the left background is where the CFL headquarters is. Randy Ambrosie walked right past me when I was eating my lunch there one afternoon last summer. I’m sure I was the only person in the park who recognized him. Yeah I was very pleasantly surprised when I checked it out this summer - it doesn’t have the hype of Berczy but quite well done. The reno of queens park is looking promising too with the new brick paving at the entrances and around the monuments. Based on the criteria though, Toronto doesn’t have much in the way of true central “downtown” parks (lots in the formally defined downtown of course). Cloud gardens has a ton of potential but is in kind of rough shape right now. A bit frthed but it will be interesting to see how college park turns out - there’s some good aspects but doesn’t seem up to the quality of berczy or grange, which probably isnt surprising given the funding arrangement.